Floating a thousand feet above the Masai Mara is supposed to be fun, right?! A moment to reflect on the effortless magnificence of creation? Time to ponder ones role in the in the world as the drama of the annual wildebeest migration plays out below? My bone white and bloodless hands had a death grip on my precious camera and my heart was beating much faster than it should. In front of me, two balloons hung above a golden sunrise with the silver stripe of the Mara river far below. A silent view of heaven waiting for a shutter snap. What was it that Merryl Streep said? “A glimpse of the world through God's eye…”? The tune from ‘Out of Africa’ was looping inside my head. I stood shaking with fear, not cold, in my tiny corner of the gondola. I was reminded of a dreadful half-hour spent atop the cliff at Hole-in-the-wall on the South African coast; the wind off the Indian Ocean buffeted me and it was all I could do to cling to the turf, face down and with my eyes firmly shut as I waited for sunset. The balloon flight wasn’t quite as bad as that, but it was certainly close! Luckily, the exotic sight of the multicolored spheres floating high above the sunrise transfixed me with a creative tension and blew the nerves away. Mostly. I wanted to marry that sunrise and that landscape together in a way that most photographers would not replicate. I was pretty sure everyone else on board thought I was nuts and I noted their straps carefully placed around their necks with their cameras held close to their chests. My own, was hanging precariously over the void with a full set of expensive Lee filters clipped to the front of the lens. Gingerly, with one hand, I tweaked the graduated filters to align with the horizon, hoping all the while that they would not come free and tumble end-over-end into the void below. It wasn’t bright and I had to shoot with a relatively slow shutter and with my forearms braced on the rattan edge of the basket. in order to avoid camera shake. As the gondola turned slowly above the plains I could hear David the pilot describing the landscape and game below but I wasn't listening. I wanted to soak as many of the sights in as I could, somehow to capture and distill the silence and the spectacle into an image that would last a lifetime. Photography is always a risk - on one hand, being behind a camera can dull an experience, ruin it even - it's often better to just 'be in it' and to forget the shot. On the other hand, photography can tease out detail, convey meaning and unleash a moment like few other mediums. Snapping away in my creative fugue I faintly registered one of the other balloon pilots calling in a problem that was forcing him to land. David, our pilot, said it was normal but everyone looked pretty nervous all the same. Behind us, the injured balloon lost altitude, its canopy looking strangely sad as it descended slowly towards the Whistling Thorn trees. It eventually landed safely, although it felt as if we’d lost a comrade in arms and now we few were flying on alone. I carried on snapping photographs in every direction before we too, started to fall towards the earth, eventually bumping and scraping over the short grass of the Mara; coming to a halt with the basket laid over on one side. This balloon trip, my first but hopefully not my last, was run by the wonderful team at Governor’s Balloon Safaris, flying out of the heart of the Mara. 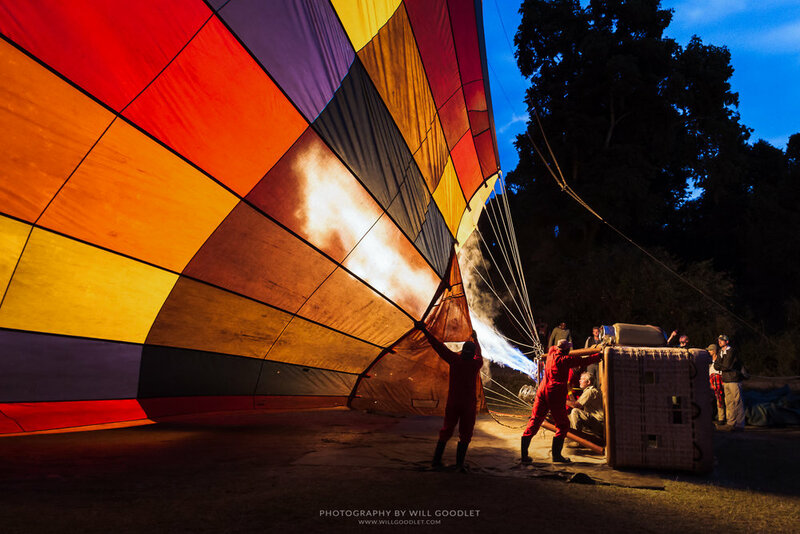 Ballooning here has to be one of the most amazing bucket list experiences on the planet!